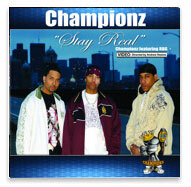 Boston-based Contemporary R&B act Championz features the dynamic personalities of their leader Quion (pronounced “key-on“), WILBZ, and Don P. Championz developed their signature style from exposure to the evolution of R&B. Championz have developed a strong following throughout New England and the Mid-Atlantic states. Championz have appeared on independent releases featuring Lil Buna, Wally Sparks, and more! Championz possess charismatic personalities with magnetic mass appeal. Their new album Title Bout leads off with “I Bet You’ll Fall in Love”. With humble beginnings that emerged from a recording studio he built in his apartment, Quion started producing, song writing, and performing original music as a solo artist, while also producing talent from his neighbourhood. Quion’s success was challenged by a string of unfortunate circumstances. He lost two artists to homicide and one to prison, record companies were hesitant to sign him due to their nervousness surrounding his signature birthmark, and he lost a significant amount of funds in a bad subsequent deal. Still, Quion leveraged the adversity in his favour. He continued to study the music industry and invest in his home studio; producing four albums and selling over 50,000 units on his own. Soon thereafter, he signed a management deal with Lou DiBella of DBE1 and produced scores for his boxing events, which aired on HBO and Fox Sports networks. Since forming Championz, the group has performed at UMass Boston, Curry College, The Palladium in Worcester, plus Club Cheaters in New York, Hood Stock in Virginia. They won a contest on Boston’s Jam’n 94.5 to open for Wu Tang Clan and were interviewed by Gee Spin. The group is preparing their Take Over Tour, to support the Take Over Limited Album series (3 volume set).